Cloned light: Could a small "quantum telescope" be as good? Quantum mechanics, rather than a huge telescope, could be the best route to high-resolution space images, according to new research carried out in the UK. If confirmed, a telescope of any size could resolve ever-smaller features of the night sky, allowing astronomers to discover exoplanets and other distant objects much more easily than is currently possible. 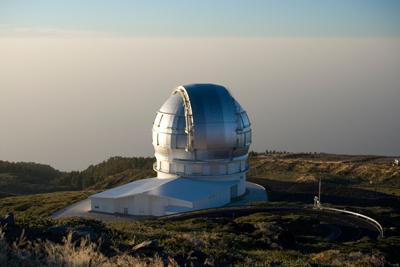 The Gran Telescopio Canarias (GTC) telescope on the volcanic island of La Palma in the Canary Islands is a prime example of a massive telescope. With a mirror spanning more than 10 metres, it is the biggest single-aperture optical telescope in the world, and has delivered some of the clearest images ever recorded of distant galaxies, globular clusters and nebulae. But the GTC was not cheap to build: it cost €130 million and took seven years. The reason the GTC and other telescopes need to be so big is to push the maximum resolution. When a photon enters an aperture of a telescope, the uncertainty in its position is reduced to the radius of that aperture. Moreover, according to Heisenberg's uncertainty principle, there is a corresponding uncertainty in its momentum, which defines the photon's initial direction. As the uncertainty in position rises with the widening of the aperture, the uncertainty in its momentum falls – allowing its direction to be determined with greater precision. In other words, telescopes with larger apertures have a smaller "diffraction limit". Aglaé Kellerer at Durham University began thinking about how quantum mechanics could provide an alternative to overcome the diffraction limit when she came across similar methods used in microscopy and lithography. "The one horizon for the astronomer today is to build larger telescopes. Somehow, at some point, we need to come up with a different approach," she says. The diffraction limit for a telescope aperture is set per photon – but if there were many identical, cloned photons arriving at the same time, the diffraction limit would be reduced by a factor equal to the square root of their number. To achieve this, Kellerer proposes that a quantum "non-demolition" measurement is performed upon each photon passing through the pupil of the telescope. Such a measurement does not reveal specific information about the photon, but only records its passing. After the measurement, the photon is cloned by letting it "de-excite" atoms, which spontaneously emit several identical photons that are then recorded by a detector, which calculates their average signal. Unfortunately, the technology required to build a telescope using quantum cloning is very far off since, lacking efficiency, current quantum non-demolition measurements are performed on laser photons. A much closer goal, says Kellerer, is a proof-of-principle experiment in which a quantum telescope would be directed at a very bright light source with a narrow spectral range. This might be done at a laboratory specializing in quantum optics, such as the Max Planck Institute for Quantum Optics in Garching, Germany, or the Institute for Quantum Optics and Quantum Information in Innsbruck, Austria. "That's the first step to do now," she says. Physicist Shigeki Takeuchi at Osaka University in Japan, who recently experimentally demonstrated a microscope that benefits from quantum entanglement, calls it a "very interesting" idea. "I have a feeling that a more detailed theoretical analysis based on quantum physics may be important as the next step," he says. Even if the principle of the quantum telescope proves to be valid, a question remains whether it would be any easier to exploit quantum mechanics than build a bigger mirror. For her part, Kellerer is confident that the time for a quantum telescope will come, saying "We are getting better and better at exploiting quantum effects...at some point it will become easier to use the quantum optical technology." The research is due to be published in June in Astronomy & Geophysics, a preprint is available on arXiv.